Yes, finally, my holidays have started! 3 weeks ahead but well, it looks like summer ended already before it even started; we had some nice days end of june and start of july, but since then… Weather su*ks. Even today, while leaving with grey skies, it started to rain again. So I’ve used my time to look some things over. Since a couple of weeks, the Norton’s taillight doesn’t come on when braking. It works for the rear brake, but not for the front brake. Which is kind of stupid, as I more often use the front brake while just barely, or not even, touching the rear brake. While I had the fueltank removed, I did see something else “wrong”, something I already noticed before; when opening the throttle, the left carburator is opened before the right one. This was a perfect ocassion to see it; when opening/closing the throttle, the slack on the cable going to the right carburator was well visible. The slack, compared to the left, was about 5 mm. By adjusting the cable on the right Amal, both react at the same time. Meanwhile it stopped raining, so I put everything back together again, the fueltank, the buddyseat, the headlight and changed the spark plugs; last time I put in brandnew Champion spark plugs. 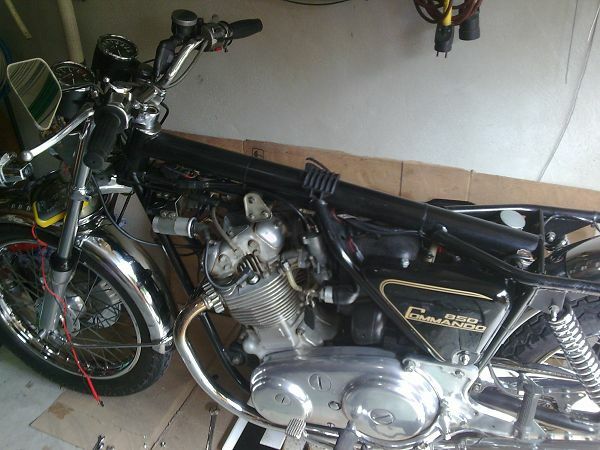 Maybe coïncidence, maybe not, but the Norton was more difficult to start. 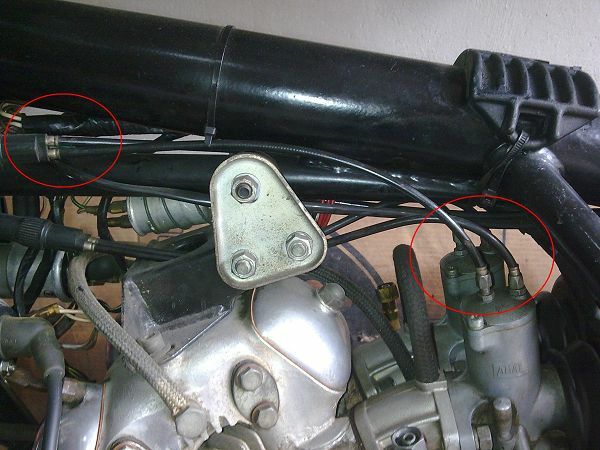 When I removed them and put back the NGK Iridium sparkplugs that I cleaned, the Norton started on the third kick. The modification by removing the slack on the gas cable could be noticed; when opening the throttle for acceleration, there is no longer the moment of “hesitation” and the Norton runs a bit better too at low engine speeds (2.000 – 2.500 rpm), less “jerky” while riding at a constant speed.